The EdgeTech 2200 and 2205 are compact, extremely flexible and configurable sonar system for integration on 3rd party underwater vehicles. They are specially designed for installation and use on Unmanned Underwater Vehicles (UUVs / AUV), Remotely Operated Vehicles (ROVs), Unmanned Surface Vehicles (USVs), and other hosted platforms. This modular unit can be configured, based on the customers’ application, to collect side scan sonar imagery, sub-bottom profiles and bathymetric data, singly or in concert with one another. Careful attention has been paid to size, weight and power consumption. The system is provided as a complete package where the 2200/2205 electronics are enclosed in a pressure vessel, or alternatively the core electronics can be provided as boards mounted onto a chassis so the customer can integrate the system into the AUV or ROV pressure housing. In both cases transducer arrays are provided for the side scan sonar (and sub-bottom profiler or bathymetry if those configurations are purchased). The arrays can be mounted in acceptable location on the vehicle, preferably away from thrusters and with a “clear view” of the seafloor. The system can operate independent of the hosted platform by simply recording and storing the data or it can be configured to autonomously interoperate with the vehicle during its mission. While EdgeTech supplies its own sonar acquisition software “Discover” on a laptop or rack-mount PC, it is also possible to interface other 3rd Party software for command and control. Subsea units can be depth rated from 0 to 6000 meters. 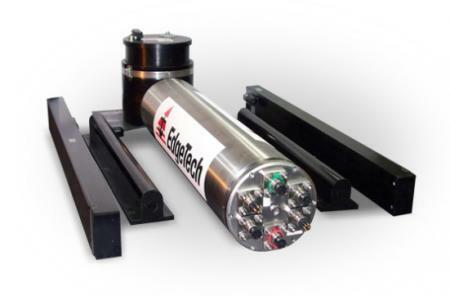 The robust and modular 2200/2205 system includes EdgeTech’s unique and exciting underwater imaging technologies: Full Spectrum® CHIRP Processing, Multi-Pulse technology (future feature), Dynamic Array Focusing (optional) and Dynamic Aperture Sonar Arrays. Our proprietary Full Spectrum® CHIRP Processing enhances long range resolutions through improve signal-to-noise ratios. Multi-Pulse technology puts up to 4 pulses in the water simultaneously thereby enabling either a 4 times survey speed increase over conventional side scan sonar systems or a marked increase of pings on target leading to superior resolutions. EdgeTech’s exclusive Dynamically Focused Arrays sharpen resolutions in the far field and enable better target identifications at longer ranges. The Dynamic Aperture of the sonar array maximizes the highest resolution imagery possible in near and far field ranges.